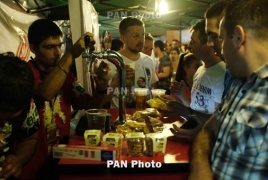 PanARMENIAN.Net - The neuropeptide oxytocin blocks enhanced drinking in alcohol-dependent rats, according to a study published April 16 in the open-access journal PLOS Biology led by Drs. Tunstall, Koob and Vendruscolo of the National Institutes of Health, and Drs. Kirson and Roberto of The Scripps Research Institute. Targeting the oxytocin system, the authors note, may provide novel pharmaceutical interventions for the treatment of alcohol-use disorder, News Medical reports.